Blocking your knitting is one of the most satisfying and transformative processes. What starts out looking like a hair net, can be utterly changed by a good soak and stretch. 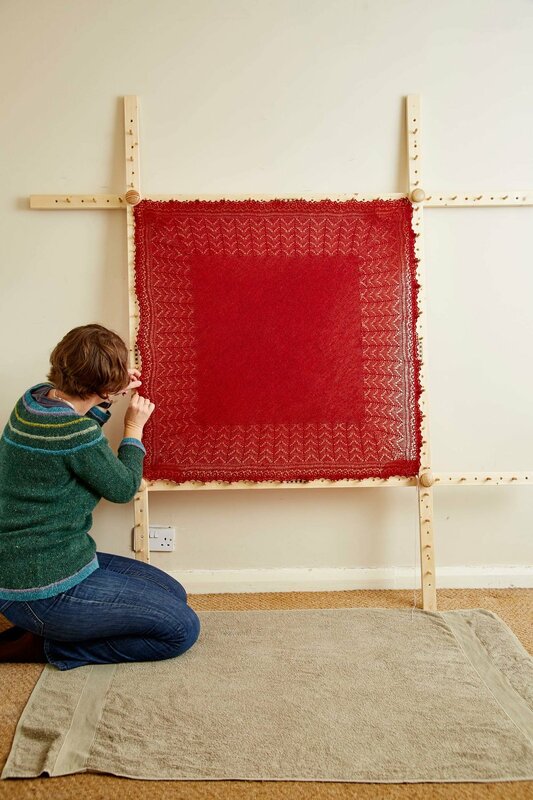 While blocking has a place in the finishing of most knitwear, it is particularly vital when knitting lace patterns. Stretching out the wet lace and leaving it to dry reveals the beauty of the patterning in a way that's almost unimaginable when you are knitting the tangled-looking mess. 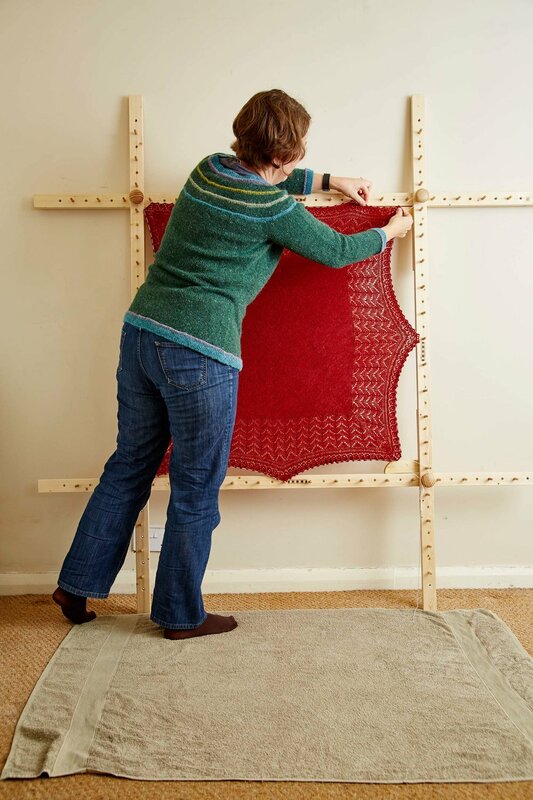 The following tutorial is going to show you how to use a hap blocking frame (aka hap stretcher) to block square, rectangular and right-angled triangle haps and shawls. Hap is the Shetland word for a shawl designed for everyday wear. They would have been made to be worn, rather than made to be sold. You can find out more about the rich history of haps in The Book of Haps, edited by Kate Davies and me, and published in June 2016. 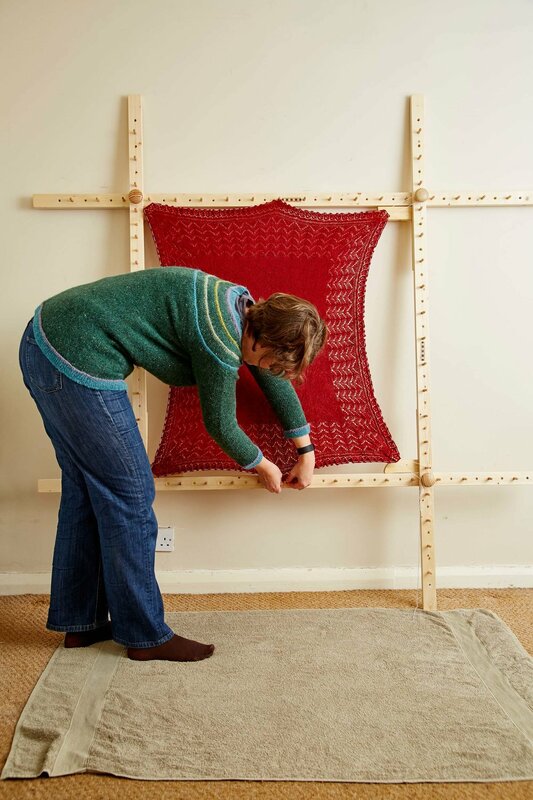 You can make your own hap blocking frame, by following Tom's tutorial over on Kate Davies' blog, or alternatively, you can buy one. I love the idea of making my own, but it's not a possibility at the moment, so I purchased my beautiful frame (shown in the photos below) from Obscure Designsph on Etsy. Having cast off or grafted the final stitches of your hap, weave in all the ends, but do not trim them. As the lace is stretched ends can pop out on the right side of the fabric, so it's best to wait until after blocking to trim them. 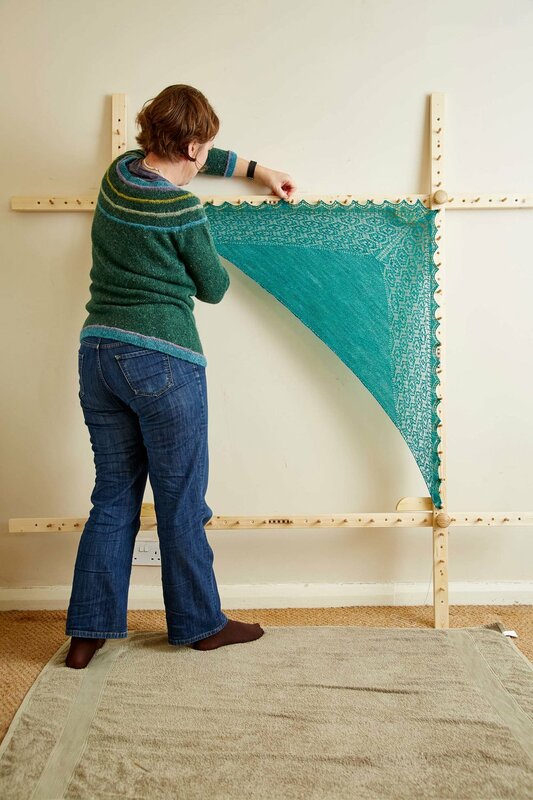 Decide on the dimensions you want to block your hap to, and cut a length of strong cotton about 50cm [20in] longer than the perimeter of your hap. 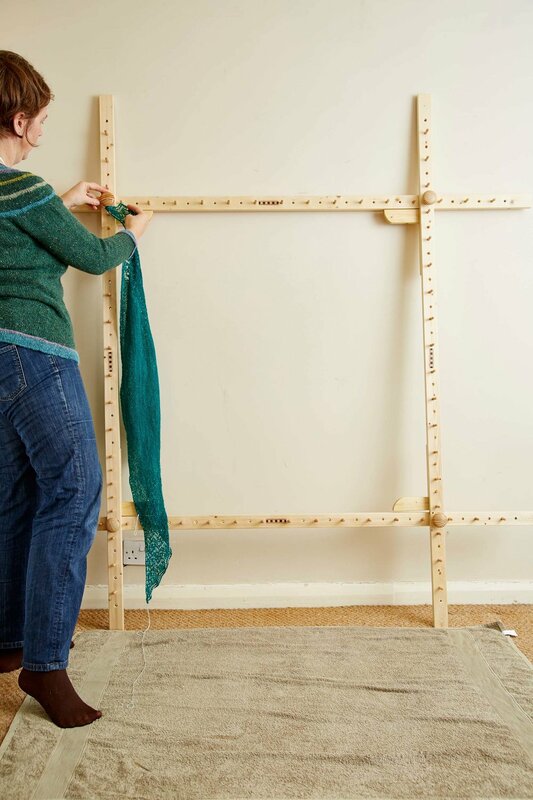 Using the screw knobs at the corners of the frame, set up your blocking frame so that the sides measure the same as your intended stretched hap. For square and rectangular haps, this will simply be the same as the outer edges of your hap. 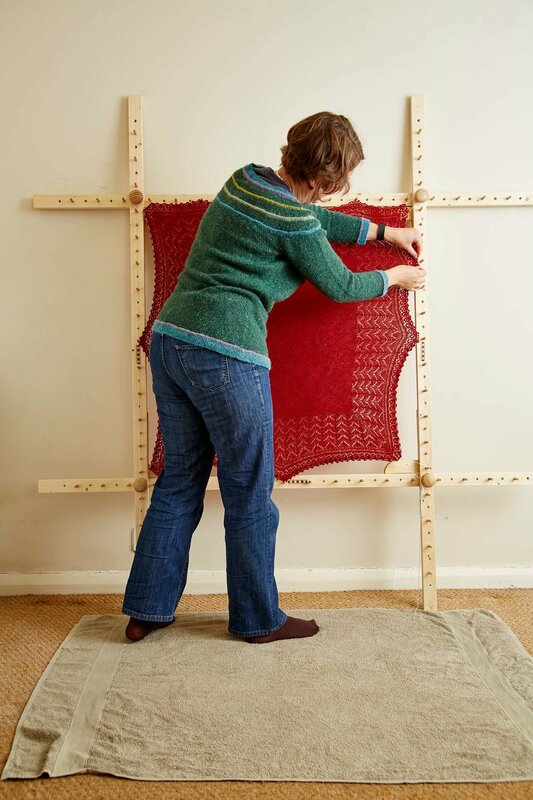 For triangular haps, make sure that from corner to corner along the frame (not on the diagonal), the side is at least as long as your intended stretched hap. My hap frame has slot-in corners to hold the frame at 90°, if yours does too, then fit them so that the frame doesn't keel over. 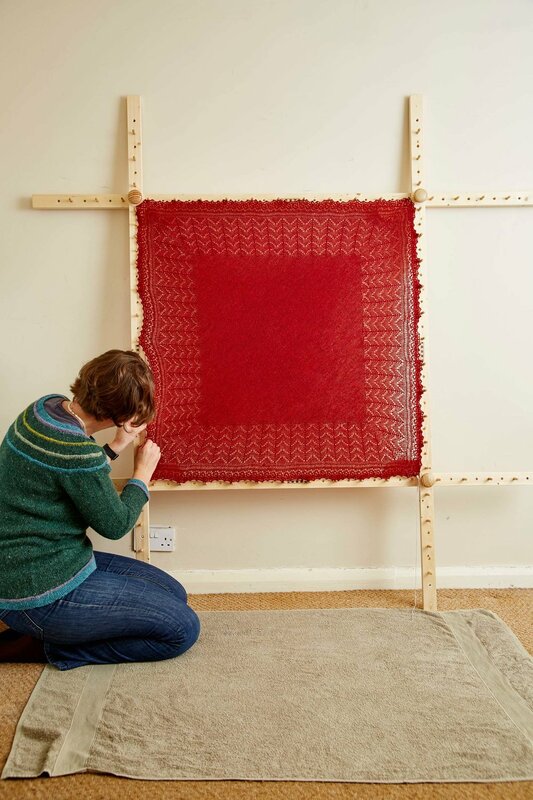 Set up your blocking frame to the correct dimensions and thread strong cotton along the edging of your hap. Take a length of strong cotton (I use 4ply mercerised cotton for this) and starting at a corner, thread it through the points on the edging of the hap. If your edging is intended to be straight, then sew the cotton along the edge weaving up and down every few stitches. Tie the ends of the cotton together in such a way that you can untie and adjust later if needed. Soak your hap in lukewarm water with a little wool wash, until it is completely wet through. I use Eucalan since it doesn't require rinsing out. Gently squeeze out as much excess water as possible, taking care not to twist and wring as this may damage the fibres. Place the wet hap on a dry towel and press it to remove as much remaining water as possible. I walk up and down on mine! 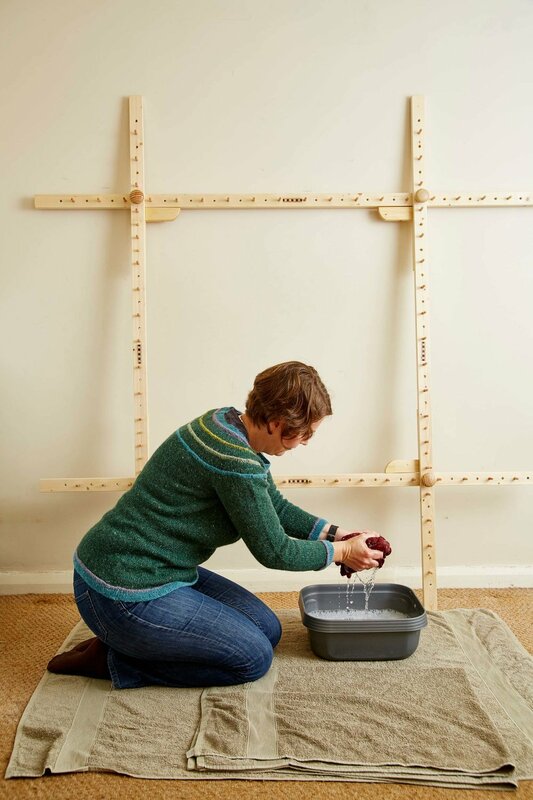 Your hap should now be damp, ready to stretch out on the frame. 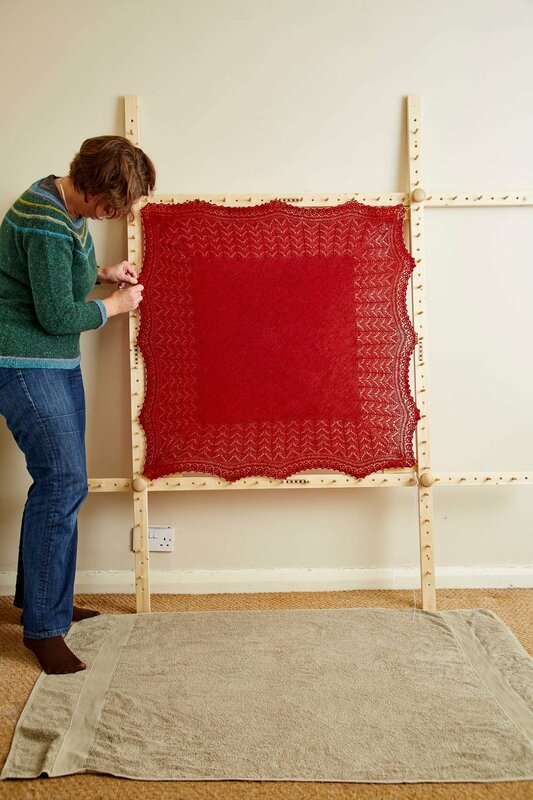 Firstly loop the cotton at the four corners of your square or rectangular hap over the knobs at the corners of the frame. 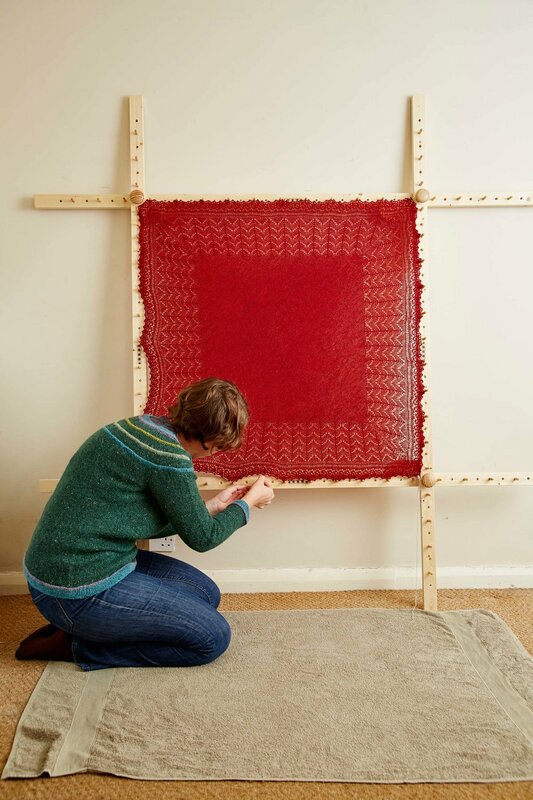 Then work around the edges of the shawl, looping the cotton thread over the pegs on the frame to divide each edge in half. Having done that, work around the hap dividing each new section in half. Working in this way ensures that the hap is stretched evenly. In order to fine tune how the hap is stretched, I then divide the number of peaks in each section between the number of pegs, and work around the edge, hooking the cotton over the remaining pegs with a standard number of peaks between each peg (some adjustment will be needed, unless you're very lucky!). This is just to ensure that you haven't got 3 peaks between pegs at one end, and 7 peaks at the other end of a side. If required you can now tighten your cotton, by untying it at the corner, and retying it more tightly. 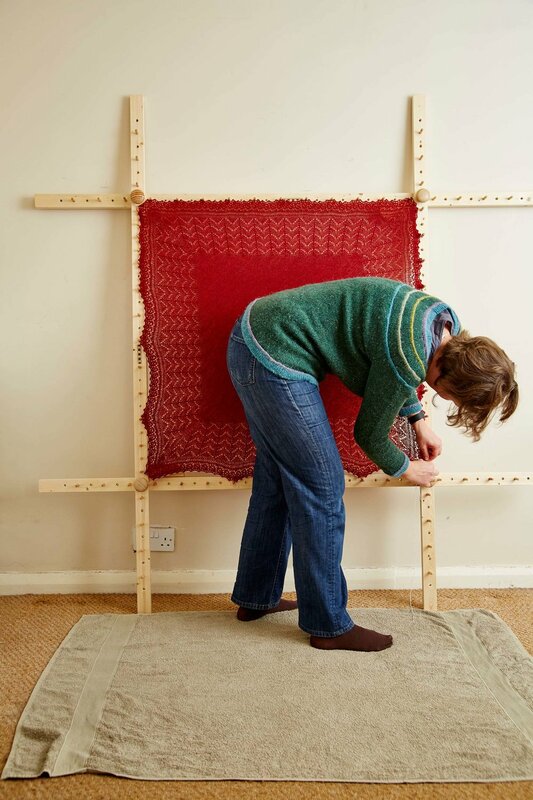 Pull the hap as close as possible to the corner knobs of the frame. Be sure to check that the hap is pulled as close to the corner knobs as possible - it's easy to over-stretch the shawl in this area. The stretched hap is now left to dry. Leave you hap until it's completely dry! Then unhook the cotton from the pegs, untie the ends and pull it out of the hap. If you have any remaining ends, now is the moment to trim them, before putting on your hap and wearing it with pride! Many of the steps of blocking a triangular shawl are identical to those outlined above. You adjust the frame, thread the cotton around the edge of the shawl, and soak and dry the hap, in exactly the same way. Hook the cotton at the corners of your shawl over the frame adjusting knobs. If necessary, tighten the cotton so that the shawl will achieve your desired finished dimensions. You may need to give the shawl a good tug to do this. When I block square and rectangular haps or shawls, the tension from all round the perimeter makes this step unnecessary, but with a triangular shawl, there is no tension along the hypotenuse (or diagonal edge), so a bit more fiddling is required at this stage. Work around the edges of the hap, dividing them in the same way as before. Once you've looped the cotton over all of the pegs, leave your hap to dry. And leave your triangular shawl or hap to dry! The real beauty of using a frame is that it requires very little floor space. This is particularly handy in houses with children and or pets! You can lean your frame up to dry wherever you like - even moving it outdoors if the weather is nice. The right angle corner braces that came with my hap stretcher are particularly handy if you're going to move your frame, as they prevent the frame from leaning over and making a parallelogram! 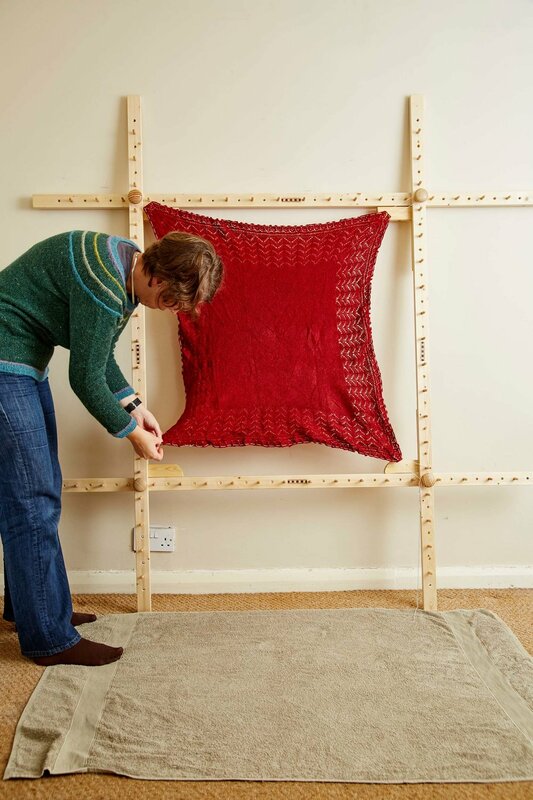 Or alternatively you can purchase a blocking frame from Obscure Designsph on Etsy (Phillip who runs Obscure Designs is a good friend, and the husband of my amazing sample knitter Kim). I purchased the hap frame from him as I love his work, and he hasn't paid me to use the frame in this tutorial. The red square shawl shown in these photos is my Bridgewater Shawl, designed by Jared Flood, and the green triangular shawl is my Flukra Shawl, designed by Gudrun Johnston (she of many wonderful hap patterns!). All of the images in this post are © Jesse Wild my awesome photographer! If you are interested in knitting a hap, or want to know more about the history of this fascinating accessory, then I would (of course!) recommend purchasing a copy of The Book of Haps.